The Zeppelin works, Luftschiffbau Zeppelin at Friedrichshafen in southern Germany, was founded in 1908 by Count von Zeppelin. A number of quite successful civil and military airships were produced before and during WW1. When Allied restrictions on aircraft manufacture in Germany were lifted in 1926, the production of the large LZ 127 Graf Zeppelin could start the year after, with the maiden flight in the autumn of 1928. 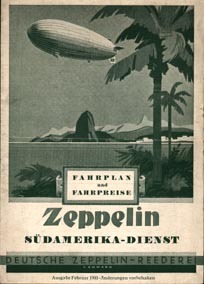 After some test flights to South America during 1930 and 1931, Luftschiffbau Zeppelin opened a scheduled service between Friedrichshafen and Recife (Pernambuco) in northeastern Brazil in April 1932. In March 1935, the South Atlantic flights became the responsibility of Deutsche Zeppelin-Reederei, after this company had been set up jointly by Luftschiffbau Zeppelin, The German Air Ministry and Deutsche Lufthansa. The even larger airship, the LZ 129 Hindenburg joined the Graf Zeppelin in 1936, and, in addition to South Atlantic flights with its parter, inaugurated a service over the North Atlantic, between Frankfurt and Lakehurst in New Jersey, in the summer. Deutsche Zeppelin-Reederei ceased operations as the commercial use of airships came to an abrupt end on May 6, 1937, when the Hindenburg exploded at Lakehurst. visit the Deutsche Zeppelin-Reederei page of Perry Sloan's "AirTimes" site. There is an article on The Zeppelin companies in Europe.